My husband mentioned his favorite painting in the Detroit Institute of Arts is of a lady knitting by a bright window. The name of the art and artist eluded him. Of all the museum’s collection to capture a man’s eye, this surprised me. Was he referring to one of the DIA’’s “women and windows” paintings I’ve come to admire? This happens when you’ve gorged yourself on art. Later, during another volunteer shift, I found Interior of a Lady by Vilhelm Hammershoi in the hall outside the Modern and Contemporary Galleries. As I suspected—Mel’s favorite. 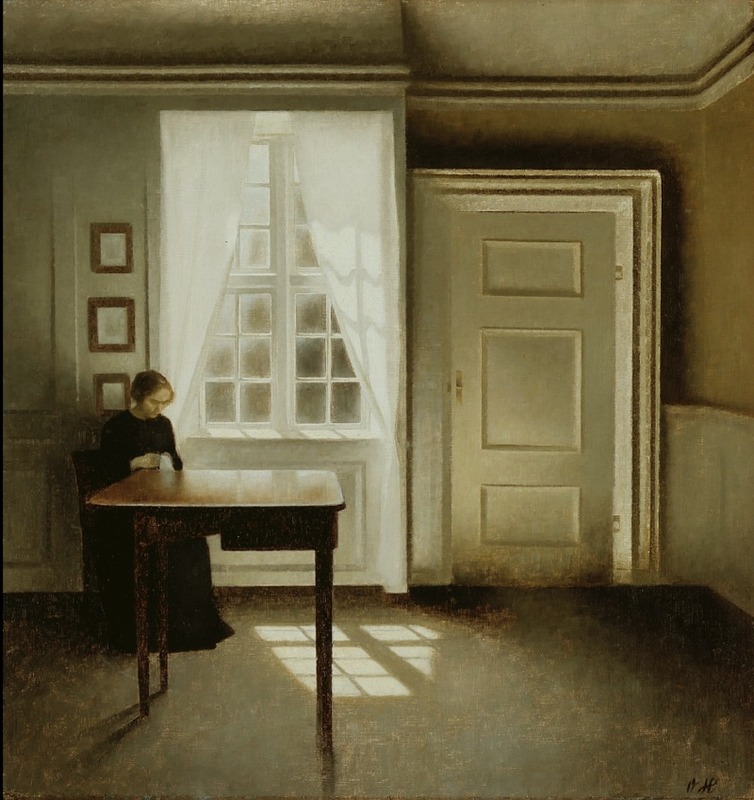 Hammershoi’s Danish lady is one of the DIA’s pieces that pair a woman with a sunlit window—in this case with a white curtain tied back, a large white door to the right. However, the seated woman in the black dress is not knitting, It appears she’s sewing or mending a hanky. A small detail, I admit, yet significant to me. And, I believe, to the artist’s composition. With his bee in my bonnet, after Friday night’s fish fry in Romeo, Mel and I returned to the DIA and settled before Interior with a Lady. “Is this your favorite?” I asked. We absorbed Hammershoi’s stunning light and shadows. “Why is this your favorite?” I asked. Serene? To me, the painting seemed profoundly sad and empty. The lady’s solitary figure is draped in black from neck to floor. Does she stitch the handy for her tears? “Do you want to see my favorite painting?” I said. 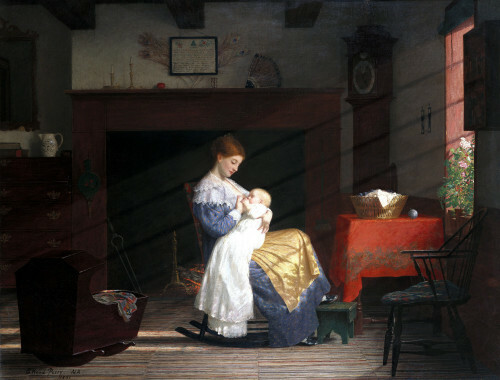 We hurried into the American Galleries to Mother and Child by Enoch Wood Perry. The loneliness of Hammershoi’s lady is a stark contrast to the tenderness and contentment expressed between Perry’s mother and child. Diffused light casts slanted shadows upon rich blue, gold, and red. Mother and Child appeals to that brief season of six years bearing my children, the joy and pleasure of them nursing, their sighs and smiles while they sleep. “This is serenity,” I said. It is natural to see these two paintings differently, as most art. To me, Interior with a Lady” reveals the demands of loss and grief—the barrenness of a house without a child, mate, sibling, or parent. Serenity comes by the unspeakable cost of forgiveness and faith. With all my heart, I want to see Hammershoi’s lady lift her head to the healing light. As Perry’ American mother, I held my infant’s hand and gazed upon her face in awe. Praise the artist for reflecting these domestic sensibilities that recall our ancestors’ gentility and propriety following the Civil War. Dear Reader, I find myself in both paintings—a woman who sits in sunlit windows to watch the shadows they cast. To lift my eyes to face the light. Pray for forgiveness and faith.